Orangeburg, S.C. – Claflin University’s Arthur Rose Museum will get a facelift when The Home Depot and Claflin’s Friends of the Earth student volunteers provide landscaping and repairs to the structure’s exterior on Friday, November 7. Claflin was awarded $10,000 from The Home Depot in its 2014 “Retool Your School” campus improvement program. This is the first time the University has won one of the awards, in a field that included more than 60 HBCUs. Claflin students, staff, faculty, alumni and friends who voted online for several weeks earlier this year contributed to the University receiving the grant. The Arthur Rose Museum hosts a number of art exhibitions, receptions and other events each year for the University and surrounding community. 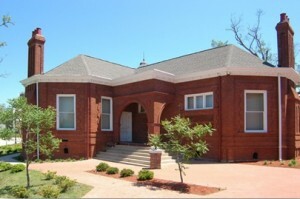 The building originally housed Claflin’s library and is more than 100 years old. It was constructed by Claflin University students. Who: Representatives from The Home Depot, members of Claflin’s Friends of the Earth student organization and University administrators. Media interviews will be available at 3:30 p.m. with participating students, Home Depot representatives and Claflin administrators. The public is invited to a brief closing ceremony and check presentation at 4 p.m.
To participate in the media interviews, please call Charlene Slaughter, assistant vice president for communications and marketing, at 803-535-5077 or Wendy Jeffcoat Crider, public relations coordinator, at 803-535-5751.